SYNOPSIS: It's not easy being a wizard before you've hit puberty, but Negi Springfield has far more on his narrow shoulders than many wizards twice (or even thrice) his age. When he's not searching for his missing father, or teaching the 31 teenage girls who make up the highly unusual class 3A, he always seems to find himself being drafted to perform magical tasks that most sane adult wizards avoid. So, when the mysterious and dangerous artifact known as the Star Crystal disappears, it's just a matter of time before Negi and his all-girl regiment of gifted students find themselves trapped in the middle of the mystery. Does fighting the supernatural satisfy the girl's PE requirement? Find out when class roars back into session for a new spellbinding semester of NEGIMA!? SYNOPSIS: The city of Tachikawa is in danger! As humans are being abducted by a strange alien entity, the city's secret defenders, the Gatchaman Squad, are leaping covertly into action to save the world once again. However, this time things aren't going to follow the usual super-heroic pattern, since the Squad's latest recruit, Hajime Ichinose, definitely marches to the beat of a different drummer. And while she's more interested in stationery than being a hero, she's about to cause a world-altering series of changes simply by thinking WAY outside the box in GATCHAMAN CROWDS! But wait, there's even more! When someone starts hijacking CROWDS technology, the Gatchaman team needs to start recruiting again and things go crazy quickly when a very unusual alien lands in Niigata in GATCHAMAN CROWDS INSIGHT! SYNOPSIS: When you're the grandson of a famous hero, you'd think that your life would be interesting, but Tota Konoe is stuck in the dullest place he can imagine! He can't even leave his tiny village until he can defeat his teacher and foster parent Yukihime, and she seems to be impossibly powerful. Then everything changes when Yukihime is attacked and Tota learns that both she and Tota himself aren't who or what Tota thought they were! Now Tota has a new, impossibly long life ahead of him and an amazing destiny that ties in with the fate of his grandfather, the legendary Negima Springfield! Get ready for vampires, demons and magic users galore as Tota discovers the perils of being a member of the world's most exclusive organization as a UQ HOLDER! SYNOPSIS: Hello Kitty and her twin sister Mimmy love to explore and learn new things, and learning becomes even more fun when you have someone to share it with. So you can imagine how excited Kitty is when she learns that her family has new neighbors, the Berry family, who also have a set of twins, Amy and Eric! And they're the same age as Kitty and Mimmy! Plus, Amy and Eric also have another brother named Harry, who is really smart! That's three new friends to go out and have adventures with! Whether they're learning to tell time, fold origami or just help around the house, there's always something new to discover in HELLO KITTY AND FRIENDS - LET'S LEARN TOGETHER! SYNOPSIS: Hello Kitty loves learning new things, and now that Kitty and her twin sister Mimmy have three new friends, it seems like there's never enough time for all the adventures they could have. But that doesn't mean that they're not going to try! From experimenting with shapes and learning to take care of flowers, to studying dance and the rules for visiting other people's houses, it's all very educational and exciting. If you want to have lots of fun and discover new and amazing things, come join Kitty, Mimmy and the three Berry children, Amy, Eric, and Harry, and share the friendship and wonder as they explore the world around them in HELLO KITTY AND FRIENDS - LET'S LEARN TOGETHER Volume 2! Don't forget about these already announced items! SYNOPSIS: The Sakuragoaka Girls' Academy curriculum traditionally focuses on the three "R"s of reading, writing and arithmetic, but Ritsu Tainaka wants to add two more "R"s: Rock and Roll! To do that, however, Ritsu has to save the Light Music Club from being shut down due to little problems like not having any other members or a faculty advisor. After strong-arming her best friend Mio into joining and convincing Tsumugi Kotobuki to make it a trio, Ritsu's would-be rockers are soon only one talented guitarist short of the quartet they need for school approval. What they get, unfortunately, is Yui Hirasawa, who's never held a guitar in her life, but she's determined to learn! Will the school halls come alive with the sound of music? 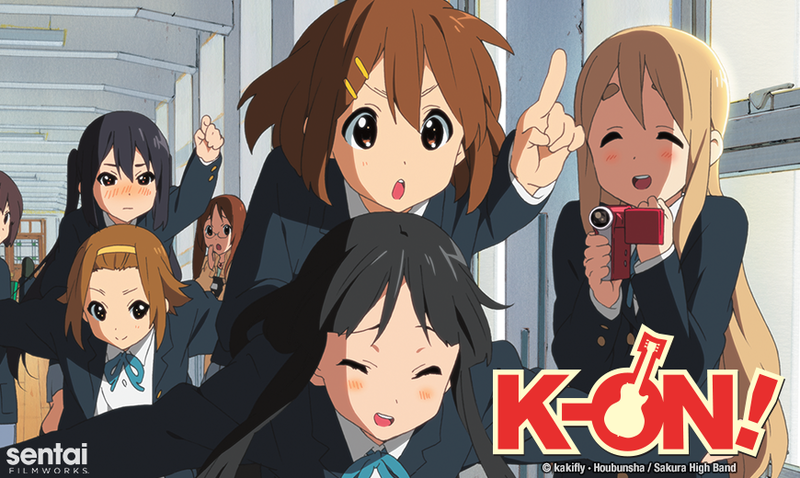 Find out as four outrageous girls band together in K-ON! THE COMPLETE COLLECTION!